I’m sorry that this is coming late, but I definitely want to share a recipe that I will be trying this weekend! For this Tasty Thursday, I would like to share this recipe from Bethenny Frankel. Whether you love her or hate her, you have to admit that Bethenny knows what she’s doing from a PR and product development perspective. I have read her book, Naturally Thin, and I have her yoga DVD’s, so I’m definitely a fan! 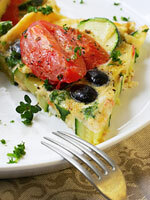 She has an article in Health Magazine and she shared a recipe for a breakfast frittata that sounds amazing! Heat the oven to 350 degrees and spray a nonstick pan with cooking spray and saute the veggies. Bake until the frittata is almost firm to the touch (approximately 15-20 minutes). Sprinkle with the cheese and bake until firm. Serve immediately. The man and I have a plan that on Sunday we’ll enjoy a delicious breakfast on our balcony (complete with mimosas) and I hope to make this frittata. I’ll be sure to share our thoughts! Enjoy your Friday and I’ll be back later to recap my eats from the past few days! 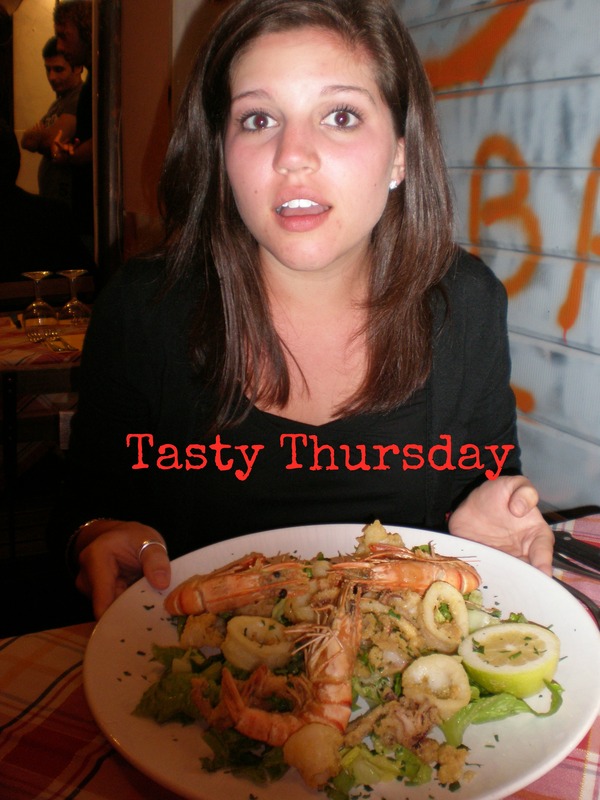 Welcome to the first installment of Tasty Thursday! This series is when I’ll be sharing some yumminess that I either want to try or have tried and really want to share! Side Note: This picture is me when I was studying abroad in Italy the summer before my junior year of college. Can you tell we went to the beach the day before? #redface We went to Capri on a side trip and I ordered a seafood platter. It was probably some of the best fish I’ve ever had. I highly recommend Capri to basically anyone who wants a gorgeous vacation! ANYWAYS – in the spirit of Cinco de Mayo, I wanted to share a guacamole recipe that my mom makes all the time. It’s super easy…and probably not even worth mentioning, but since it is Cinco de Mayo, whatever. All you do is cut the avocados, tomatoes and onions and then mix together. Then cut the limes in half and squeeze over the avocado mixture. Then add the salt to taste. Enjoy with your favorite tortilla chips!